Maybe it was the success of the last blanket that inspired me to try another, or maybe I had destroyed that part of my brain that tells me blankets are a bad idea. Whatever the cause, when I saw the offer of a free pattern from Tin Can Knits, I chose the POP! Blanket. Then, because I do not want to contract norovirus, I chose a yarn other than Noro. Yes, the brand and the ailment are bonded in my brain for many reasons, not the least of which was the time I contracted it from a gathering of knitters. I really do not hate all Noro yarns, but I am weird. Anyway, for this blanket I am using Classic Shades in Watermelon (and perhaps Rainforest and Tropics) and Sheep(ish) in Grey(ish). While I am only twenty-five blocks into the project, I do not yet hate it. This works very well for on-the-go knitting, and I can complete a square in a relatively short amount of time. Each piece looks a bit terrible when it comes off the needles due to the curling nature of the stockinette, but I blocked the first square, (as the pattern directs) and it worked out the way it should. 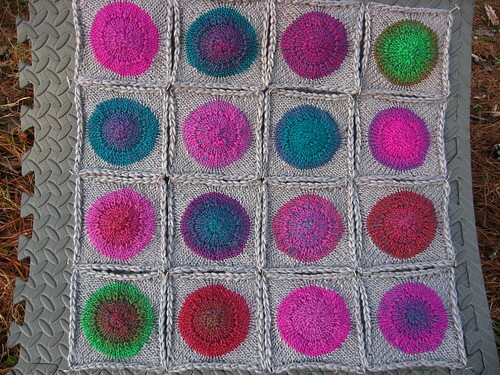 My squares are a bit smaller than those in the pattern are, but I like the way they feel, so I am not changing anything. I have not decided just how large I am going to make this blanket, but I do not think I am giving it to a baby. Then again, I am not very far into the process, and baby-sized may be all I can handle. As an extra bit of motivation and inspiration, I wove in ends and blocked fifteen more squares, and I really like what is happening. It even takes the sting away from just how many more I need to knit. I have been trying to make sure that I keep up with weaving in ends so that part does not become too overwhelming. I also bought more yarn so that I do not have yarndage troubles. I think I may have bought a bit more than I will need. There is a small story behind that. At first, I only bought one ball of the Classic Shades in case I did not like knitting this pattern or found that the yarn would not be a good match for it, but since it all seems to be working, I needed more. I went to the yarn store to get more of the Classic Shades in Watermelon, but they had one fewer than I needed. I So, I looked at other colorways to find one that might work with it, and I chose Rainforest and Tropics. Yes, that is two, and I only needed one more ball of yarn, but this gives me the option to make a really big blanket if I so choose. Having a reputation as one of enormous ego and a legendary sense of self-importance, I know it does not come as a shock to any of you to read that I have declared myself winner and champion of February Finishes. If I do not complete anything else, I will still be victorious. In fact, it is possible that I hold the title for next year, so great is my accomplishment. My extraordinary skills and gifts do not extend to getting a good photo of the finished piece. For all of the fanfare, I can only present a nighttime blocking shot. I was going to go outside for the little bit when the sun was shining over the weekend, but the odor of whatever a neighbor was burning kept me inside. 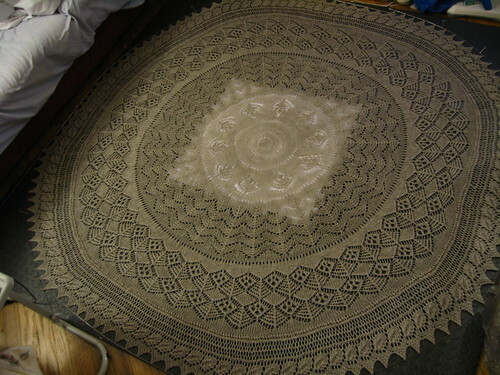 Anyway, the pattern is the Shetland Tea Shawl from A Gathering of Lace, and I love it. It is not a difficult knit, if you have enough yarn. That was the trouble for me. I ran out of yarn, was able to acquire a little bit more in the same dyelot, but it was not enough, and there it sat. Finally, I bit the bullet and ordered a few more balls of the Brown Sheep Naturespun Sport in the Ash colorway in hopes that whatever dyelot arrived would be close enough, and I think it works. If it does not, I hope that you will support me in my delusion that you cannot really tell where the change occurs. Anyway, it is pretty, it is big, (about six feet across) and I managed to finish it just shy of four years after the start date. I win. Well, there is only one more Christmas gift to show you all, and it was a doozy. It was one of those ideas that nearly did me in, and had its hooks in me before I knew what had happened. Since my mom found the pattern, she earned a portion of the credit and the blame. When the idea first struck back in September, I thought I would make these for everyone I know who loves Legos. I would make one for the newest nephew, (the original plan) one for my younger brother, and then for the other two nephews. My mom (she knows how to crochet) was going to help make blocks, too. This would be a family effort, and so special. It was going to be my go-to baby blanket pattern. I was going to make one for Kitten's Elizabeth, and then for each of her other boys. I have friends with little ones who go crazy for Legos, and I was going to make them for all of those kids. Oh, I wasn't going to do it all at once, but maybe one every couple of months. It all seemed so reasonable. The little blocks that make up the blankets are so quick and easy to make that I had finished (even had the ends woven in) the first twenty in no time at all. Then by the time I had thirty done, I was losing the will to live. At this point, it was also apparent that Mom's crocheting, well, we will just say she would not be able to help with this. Somewhere between blocks thirty and fifty-five, time stands still, with the exception of that brief moment at forty--the halfway point. Amazingly enough, once I hit sixty I was back on a roll again, and soon after that, I had finished all eighty bricks. I set them aside for about a week until I had the uninterrupted time at home to assemble it, and then I was done. I was amazingly pleased with it, and I think I could make this again, but I just do not know when I will be ready to tackle the challenge. Anyway, the blanket was a big hit, and my younger brother was visibly jealous. The baby chewed on it, but I did not get a good picture of him with his new blanket. He was a very blurry boy that day, but I hope he loves his blanket for years to come.